Whether you have an existing paddle wheel based WakeboardPro or the Three Event DigitalPro, your “plug& play” GPS Upgrade can be installed in minutes. (In fact almost any PerfectPass System built over the last 15 years can be upgraded.) The Upgrade Kit includes a new Master Module & GPS Receiver. To install you simply unplug the cables from the existing Module and reconnect to the new Module. Mount the GPS Receiver, connect it and you are done! 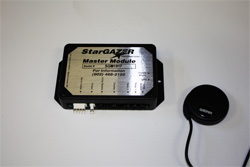 The Star Gazer can only be mated with a multiline Display. If your PerfectPass is less than 10 years old then you will already have the correct Display. If you have an older “single line” lcd Display then this must be replaced as well. If you are not sure, simply contact our tech support line for assistance.